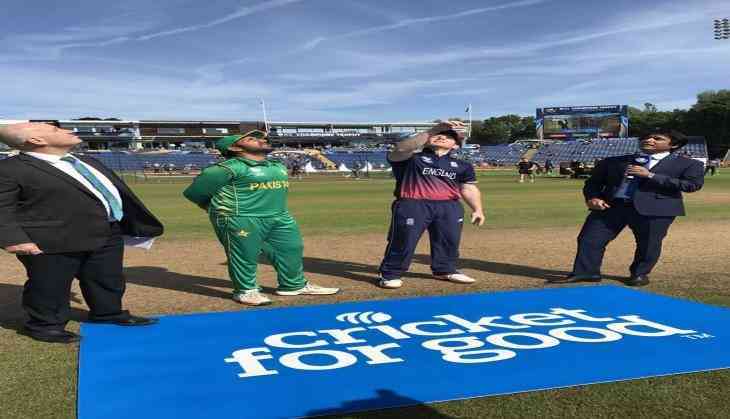 Pakistan captain Sarfraz Ahmed won the toss and elected to bowl against England in the first semi-final of the ICC Champions Trophy, here today. England replaced out-of-form Jason Roy with Jonny Bairstow, while Pakistan made two changes in their playing eleven. Left-arm pacer Rumman Raees will make his debut in place of an injured Mohammad Amir, who suffered a back spasm, while Shadab Khan came in for Faheem Ashraf. England: Eoin Morgan (Capt), Jonny Bairstow, Alex Hales, Joe Root, Jos Buttler, Ben Stokes, Moeen Ali, Adil Rashid, Liam Plunkett, Mark Wood, Jake Ball. Pakistan: Sarfraz Ahmed (Capt), Azhar Ali, Fakhar Zaman, Babar Azam, Mohammad Hafeez, Shoaib Malik, Imad Wasim, Rumman Raees, Shadab Khan, Hasan Ali, Junaid Khan.